We are excited to share that Terese Svoboda will be reading some new poetry along with Dennis Nurske at Local 138 on February 10, 2017. Terese has several other upcoming events such as The Lives of Others: Biography as Creative Nonfiction panel at AWP on March 10, 2018, and celebrating the paperback of Anything That Burns You: A Portrait of Lola Ridge, Radical Poet at Book Culture with Ajay Chaudhary on March 12, 2018. For more information and events with Terese we recommend visiting her events page at teresesvoboda.com. Terese’s appearance in Superstition Review begins with an interview in issue 5. She has contributed several guest posts, and has been part of our SR Pod/Vod Series, which can be found here. Madonna in the Terminal, a fiction piece by Terese, can be read in issue 7. 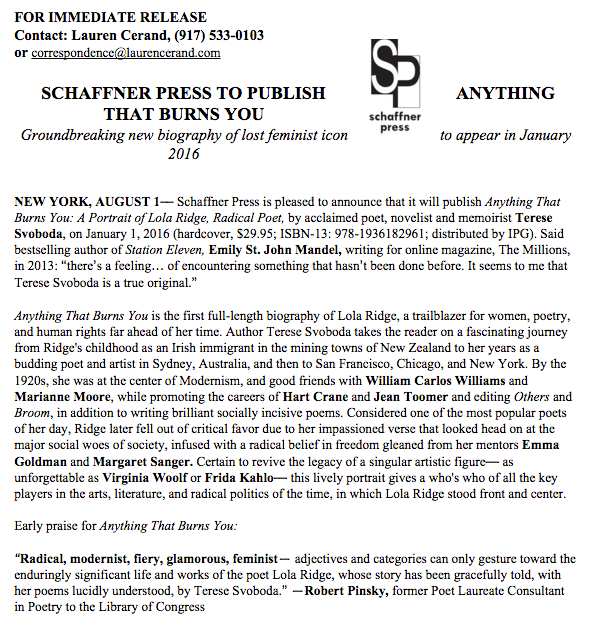 Congratulations to SR Contributor Terese Svoboda on the release of the full-length biography Anything That Burns You: A Portrait of Lola Ridge, Radical Poet. This is the first biography ever published on Lola Ridge, an Irish immigrant and a feminist poet who was truly a trailblazer for human rights. For more information, please view the press release below. Bursting asunder the too small house. 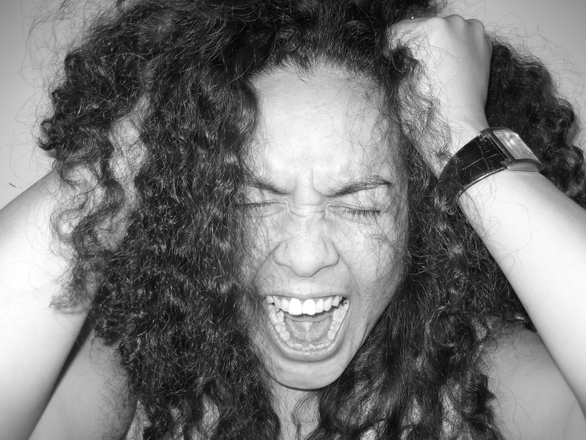 With anger you only have to flex the muscle, not kayo the reader, allowing her to judge whether she is going to join you in your anger—the way you would with regard to any emotion expressed in a poem. That flexing is difficult, an art. When Czesaw Milosz published “Sarajevo,” a poem that wasn’t his best, he told his translator Robert Hass, “Sometimes it is better to be a little ashamed rather than silent.” The world is full of uncalled-for beauty and senseless tragedy and perfidy, and poets must try to express all of it. 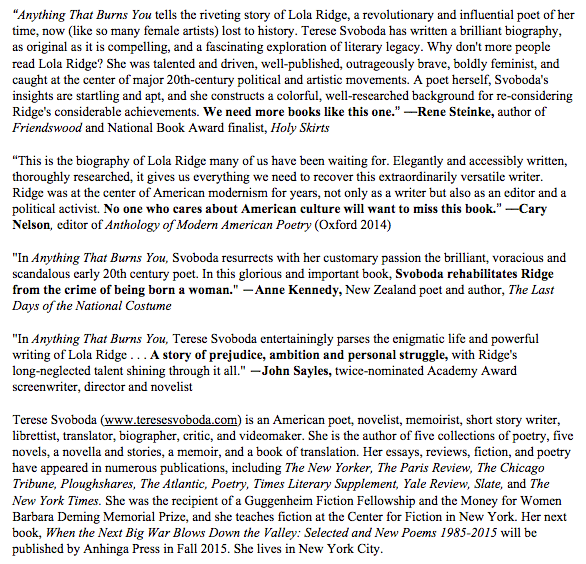 The Brooklyn Rail recently wrote: “Terese Svoboda is one of few contemporary American writers who possesses a global consciousness.” I don’t want to remain silent. Is that a problem for you? I’ve been teaching a class at Columbia which Gary Scheytgart calls Fiction for Dummies but is more accurately a fiction class for poets and creative nonfiction writers who want to steal from the genre. One of these students emailed me with her first story, exclaiming how hard fiction is to write, compared to nonfiction. You have to make everything up! I have just concluded the opposite. I am writing a biography/memoir about the life of anarchist Modernist Lola Ridge who consorted with the likes of Marianne Moore and William Carlos Williams. You’ve never heard of her, partly because her executor has been promising a biography for the last forty years and is holding the papers, and partly because her work didn’t follow the Eliot and Pound maxims of staying divorced from life and politics. My publisher suggested a fancy hybrid approach of biography/memoir, not me. Researching and then organizing that research along the lines of creative fiction, that is, with characters, plot, motivation, is a double job to start with. I’m triply challenged when I apply myself to the memoir aspect. Just having lived through events doesn’t give me anything approaching insight. Sure, there’s a nimbus of emotion surrounding the madeleine but where is causality when I need it? I strongly prefer to concoct fiction that slowly reveals itself while I am discovering the details to support it. 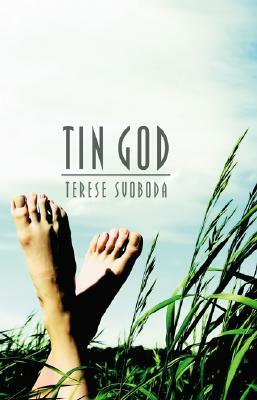 My fourth novel Tin God, reissued this April, started from a dream about a conquistador and a “drug situation” maybe my brother was involved in. All I had to do was figure out how to put two completely different stories together. With nonfiction, you have all these footnote-y details lying around everywhere that don’t quite go together. And where are they when you think you’ve got a match? But there is, I admit, big payoff when—voila!—I uncover a piece that illuminates everything, e.g., a letter that says Ridge regretted dropping her son off at an orphanage. I say: footnotes for fiction! Let’s make those fiction writers cough up their sources, they (and me) who so easily assert that they’re crafting truth out of the dross of imagination. Let’s see the ticket that cop gave you that made your mother so mad you had to write a short story to figure out she was having an affair with him. You know you have it around somewhere.